JAMES H. PYUN received his Juris Doctor Degree from Boston University School of Law in 1991 and his B.A. from Dartmouth College in 1986. 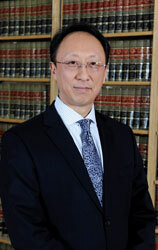 He is admitted to practice law in the State Courts of New York and New Jersey. He was an associate at the firms of Davis, Jenckes, Kilmarx & Swann in Providence, Rhode Island and Reinwald, O'Connor, Marrack, Hoskins & Playdon in Honolulu, Hawaii, where he researched and analyzed a wide range of general practice issues. He also served as a law clerk for the United State Attorney's Office in the Southern District of New York, where he researched jurisdictional issues in connection with the federal prosecution of Imelda Marcos. Until September 1992, he was a law clerk at the Law Office of Ronald LeVine in Hackensack, New Jersey, where he researched issues in commercial and bankruptcy law. In March 1993, he became an associate with our firm. Jim became a partner in the firm in January 2005. Jim's practice is concentrated in the areas of public construction contracts, including drafting architects' and construction managers' agreements, construction and surety litigation, special education appeals and Education Law litigation. Jim has successfully argued appeals before the Appellate Division, Second Department and the Second Circuit Court of Appeals and has written numerous successful appellate briefs to the State Review Officer, the Appellate Division, Second Department and the Second Circuit Court of Appeals.